I'm Featured on The Blended Blog Today! Today I am being featured on The Blended Blog. It is a collective blog featuring many creative voices, written by a group of talented lifestyle and fashion bloggers. I am honored that my friend Lana (who also writes Two Teens and Their Mama) interviewed me for today's "Featured Friday" post. I hope you will stop over there and check it out. Lana and I were lucky enough to discover each other's blogs right away when we both began blogging. We have been friends ever since. We've met in person several times and even participated in a walk together. Seattle Rock'n'Roll: Running, Walking, and Reuniting. I once guest posted for Lana, and you might enjoy my Blackberry Crisp Recipe from that article. And ... you might even learn a thing or two you don't already know about me when you read my answers to the interview questions on The Blended Blog! My posting schedule has become sporadic this summer, as I am putting my energy into spending time with family and friends. It will become more frequent again next fall. My next post will be published one day next week, and hopefully, it will save you a little time! Which do you think is harder: creating a set of interview questions or answering them? Sometimes You Have to Step Back Before You Can Move Forward. This blog has been quiet for about three weeks. I just had to step back before I could move forward. 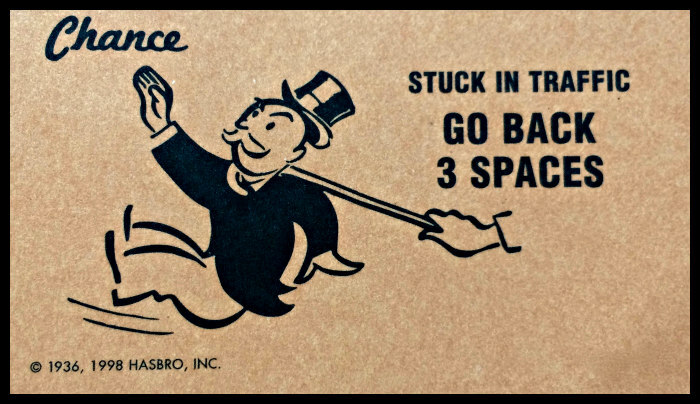 Just like in the game of Monopoly, life sometimes forces us to take a few steps backward before we can move forward. Since my last blog post, my days have been filled with graduation celebrations, various home projects, vacation planning, dealing with a car repair, and a trip to Canada to be with a family member during and after his surgery. Instead of blogging, my recent free time has been spent doing some on-line course work and listening to some writing/blogging on-line seminars. Despite not publishing anything recently, I have been getting some new ideas for posts and ways to make some improvements to this blog. I hope you will stay tuned! I'm excited to announce that a previous post of mine has been published today on another website. It first appeared here, but now my article about blog buttons can be found on Beyond Your Blog, retitled there as "How-To Tips For Blog Buttons." Even if you read the original version, I encourage you to visit the Beyond Your Blog website and see the wealth of information it offers to writers and bloggers. In fact, I recently completed their e-course Submission Savvy and learned a lot from it. I feel honored that my article was worthy of being published on that site. For the remainder of the summer, my blog post publishing schedule may remain sporadic, but hopefully a little more frequent than over the past month. Today is American Independence Day and Friday was Canada's 149th birthday. 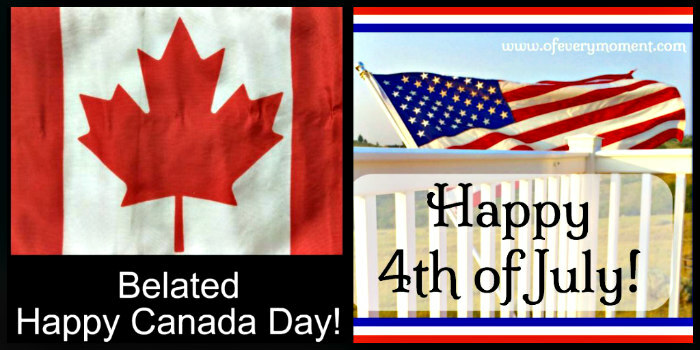 Happy July 4th to all of my American readers and a belated Happy Canada Day to all Canadians! As we celebrate these milestones, current events remind us that our world is still far from perfect. I truly hope that someday we will all celebrate an International holiday marking an annual celebration of worldwide peace.